With this October fall, get ready for a good November and December market! Dow Jones has fallen more than 1000 points from the historical high of 17350 to a low of 15855 reached intraday on 15th October. STI similarly spiraled downward in spectacular fashion with a more than 200 points drop to a low of 3155 recently. A lot of investors began to get worried of the European economy and the risk of rising interest rate. The protest in Hong Kong did not help the situation. Despite all the uncertainties, we would like to assure investors that all is well and we do anticipate the stock market to turnaround in November and December. 1) US economy is growing at a very healthy level. This is shown in the September unemployment figures released early October. US reached a low unemployment rate of 5.9%. It proves that the three Quantitative Easing (QE) policies are working well and providing more jobs for Americans. This is the primary reason the Federal Reserve Committee set out to do when QE1 was launched in March 2009. Although it is a long wait, we believed that with more jobs created, consumer confidence and consumer spending has never been better. We know that US property prices are rising more slowly than what the market would have liked. The reason of the slow rise is not because of poor economy but over supply of houses in the market. In this past two years, as property prices got slightly better, the Mortgage Banks are disposing off their properties in bulk which caused the market to be flushed with properties. However rest assured that inflation will kick in once these properties are consumed by the market. 2) FED transparency works wonders. It has been a well-known fact that ever since Ben Bernanke stepped on board to be the FED chairman, FED has adopted a transparent policy. They try to give monetary policy outlook in advance rather than make abrupt decisions that shock the stock market. This transparent stance is continued by the new FED chairperson, Janet Yellen. The FED recently came out with a DOT PLOT diagram that gives us a glimpse of the blueprint of the short term interest rate for the next 3 years. It was forecasted that by end of 2017, interest rate might rise to 3.75%. What is good about this transparency is that it won’t cause the market to suffer from a market panic. A slow and expected rise in interest rate is always good for the stock market. With a slow rise in interest rate as mentioned by Janet Yellen, we don’t see a bear market forming yet. It is definitely the job of the FED to constantly provide feedback and updates on the timing of the rise of interest rate. So far, they have been doing a good job. 3) Festive rally is in the pipeline starting in November. This is especially so when Apple reports a terrific 4th quarterly earnings on Tuesday, 21 October 2014. Their good earnings is coupled with a good iPhone 6 sales. The sales beat historical iPhone launches and is poised to continue into the festive season. Apple good earnings show something more important than strong iPhone sales. It reflects the confidence of the retail market! It shows that Americans are still willing to spend. 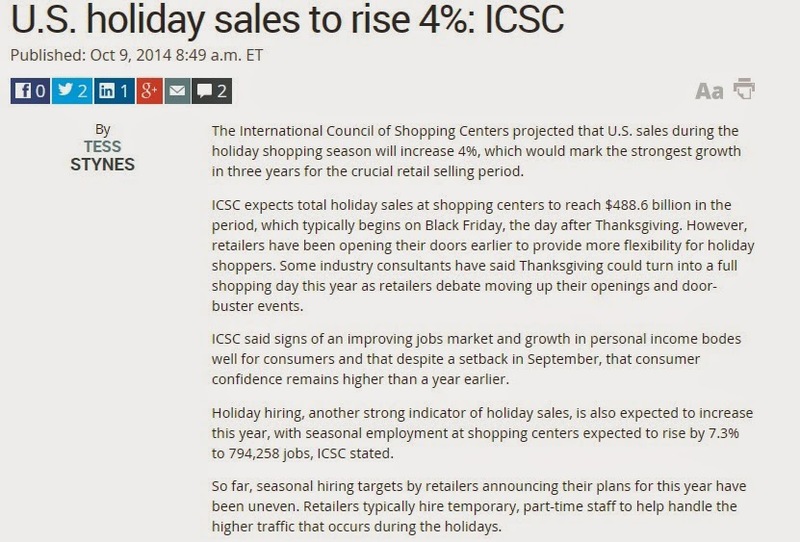 And this optimism will likely be shown 2 weeks before the thanksgiving holiday on 27th November. I am quite optimistic about the sales of Black Friday this year on 28th November, a day whereby Americans go out on the streets to buy discounted items. This is like the Great Singapore Sale, and it is often a gauge of the retailers confidence. With this fall in October, we do think that the festive cheers will ring on the stock market this year amid the expected good retail outlook. Our trading strategy for now would be to look closely at the stock earnings this month. Do not miss out on the chance to invest in some of the good counters that show better than expected earnings and were already oversold. Get ready for a good early Christmas gift this year! Andy Yew has accurately the turnaound of the market recently. Join him to know how what he is looking at next month! With the good performance of Apple earnings, Bullish festive rally in November and December is in the cards! We are very optimistic of the recent October fall. We think that with this fall, the market is about to rally into end of december. Although DOW went down 100 points at one point today, we do not think this fall is sustainable. Most likely it will bounce back up soon. This is especially so when Apple reports a terrific 4th quarterly earnings yesterday. Apple strong earnings show something more important than better ipone sales. It shows the confidence of the retail market! It shows Americans are still willing to spend. And this will likely be shown 2 weeks before the thanksgiving holiday on 26th November. I am this time very optimistic about the Black Friday, a day whereby Americans go out on the streets to buy discounted items. This is like the Great Singapore Sale, just that it is a one day, major shopping day in America. I suggest all to look at this quarterly earnings season and get your weapons ready! We might be in for a good market rally this november and december!